Feb. 25, 2015 1:00 p.m.
By day, he is a mortgage specialist, working hard to help his clients. For the remainder of the week, he is a dedicated City of Leduc councillor, a loving husband and family man, a fit and community-focused individual and … a published author! David Mackenzie has now published a new novel titled Calypso. His second tome was released on February 18, just in time for the book signing event at Leduc’s new municipal library. His first novel Undertow, published in 1999 and also set in Barbados, has earned great reviews. Calypso, a 241-page novel presented in a condensed little book measuring four by seven inches, offers an easy, fast-flowing and colorful read. It is the story of an oil executive who proposes a controversial development in Barbados, while dealing with great concerns within his empire, set in Texas, Calgary and Edmonton. References to the Oil Patch and to international trading, clever descriptions of corporate and governmental procedures and vivid descriptions of Barbados landscape as well as a complex story line keep the reader engaged until the dynamic ending. The book’s small format makes it easy to hold for a long uninterrupted period. Dave Mackenzie has used his long career in the banking industry to smartly create a story of international banking intrigue. He happily refers to elements of his personal life such as his favorite hockey team the Oilers, and the novel’s main character’s brother who is a firefighter like Mr. Mackenzie’s son Chris, an Edmonton firefighter. He is also intimately familiar with Barbados landscape, having visited family there numerous times. The book is being sold in the Leduc region at the newly-opened Busy Bean Café, Gift Solutions on Main Street (50th Avenue), and the Leduc Regional Chamber of Commerce office. Interestingly, two other venues will benefit modestly from the sale of this book: the Leduc’s Royal Canadian Legion and the Leduc Golf Course, where the book is also sold. On Saturday, February 28 from 1:00 to 3:30 pm, the Busy Bean Café on Leduc’s Main Street will host a book signing. 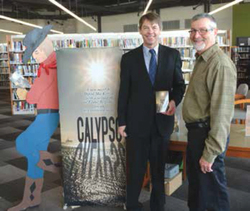 At the Leduc Municipal Library book signing event, Mr. Mackenzie greeted a steady flow of residents, library users and friends coming over to get their copy of Calypso signed and to wish him well. Pictured: Friends and residents came to the Leduc Municipal Library to get their copy of Calypso signed by the author, Dave Mackenzie. Photo by Dominique Vrolyk.